A day in the life of a Sparrow Swap intern. Hi all! 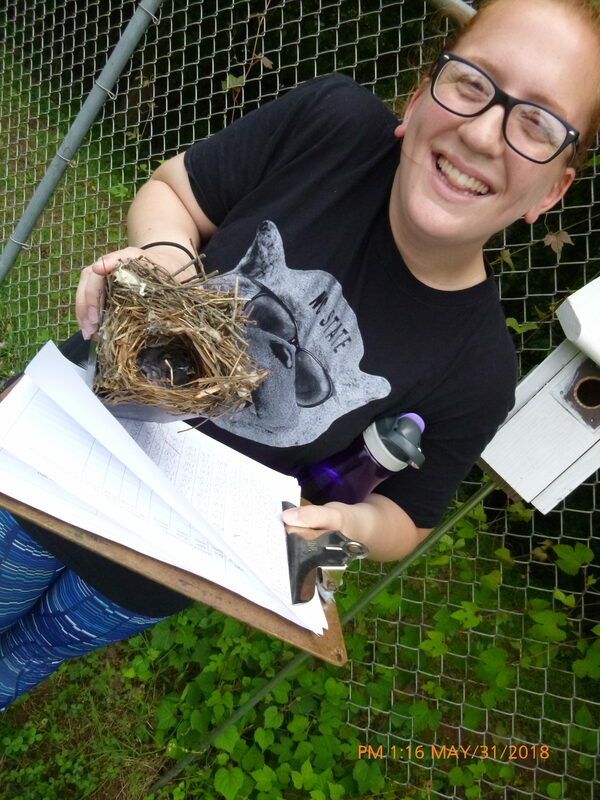 My name is Heather Colter and I intern at the biodiversity lab in North Carolina Museum of Natural Sciences for Sparrow Swap! A little background info, I am going to be a senior in the fall at NC State University and my major is Fisheries, Wildlife, and Conservation Biology in the College of Natural Resources. I have really enjoyed my time with the Sparrow Swap team learning not only the technicalities of the project, but also getting to know the members and leaders within. Not to toot any horns, but the interns who work with Sparrow Swap are really important to the whole of the project; we work really hard to keep everything straight. One of my favorite aspects of the project is when we go out into Raleigh and check the various boxes we have put out. It’s always such a treat when we find eggs, or, like in the photo above, when those eggs have hatched and become fresh baby birds! This photo was taken at the Farmer’s Market in Raleigh, it is a clutch of house wren chicks; the parents were nearby making a ruckus but it was a great find nonetheless! It was extra special because the six eggs we had counted in the previous week turned into six healthy and alive chicks, so that’s a great bonus. Other duties for the interns include neverending data-entry/proofing, measurements of eggshell thickness, and curation of the clutches sent to us. Curation happens before we can get to measuring thickness; for curation we take the eggs and we measure their length and width and take a final mass to determine if there was any leakage or “weeping” since the egg first came to us and we took its initial weight. After that we use a Dremel tool to cut through the shell and then we poke through the membrane underneath with a instrument resembling a long metal toothpick. We then jar the contents of the egg if able to, and then we wash out the inside of the eggshell and leave it to dry and then we mark it with the clutch number and specific letter (A, B, C, D…) with an archival pen and store them until someone is ready to take their thickness measurements. Measuring the thickness is done with a tool called a micrometer, and we take six individual measurements of the sawed off cap of each egg within each clutch, or we use a broken piece of the eggshell if there isn’t a cap to measure. Of course, we write down all of these measurements into sheets, along with notes, and then we enter the information into the Sparrow Swap database. Working with Sparrow Swap has been an amazing opportunity and I have enjoyed it every step of the way! This post was written by Heather Colter. To learn more about Heather and the rest of the Sparrow Swap Team, check out our Team Page.